Bad pour, the beer wasn’t over carbonated. Almost two months ago, I brewed the inaugural TNBC beer: TNBC One. It was to celebrate the last several plus years of friends getting together to share in American craft beer and home brews. Aroma: Lots of hops. Citrus, floral and abundant. The malt is a bit more pronounced than expected: bread/biscuit. Taste: The citrus and floral hops are muddled together. Neither is clear but believe that is assisted by the amber malt, confusing the palate by adding a huge mix of biscuity flavors. Drinkability: Medium or better body but lower carbonation than I would have liked (in spite of the huge amount of head). Dry finish. Alcohol is not evident. Overall: The hops are fantastic. The combination of the Citra, Amarillo and hopping techniques created a huge amount of flavor and aroma. In spite of this, the amber malt lends too much malt profile, bringing down the joyous celebration of hops. 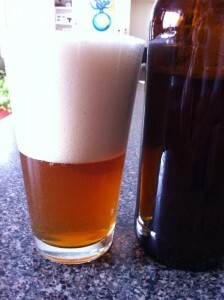 I would brew the beer again but drop the amber malt down a few notches; 8 ounces at most. After the re-brew, I would check to see the brightness of the hop profile to see if that needed tweaking as well. Enjoy! Useless Fact: During the time of Peter the Great, any Russian man who wore a beard was required to pay a special tax. You are currently browsing the Sips blog archives for February, 2014.